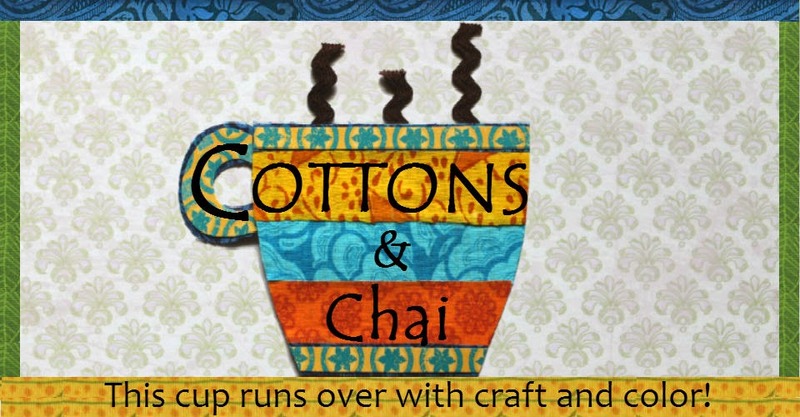 We're very excited to enter the Blogger's Quilt Festival for the very first time! This one of a kind quilt will go into the original design quilts category. 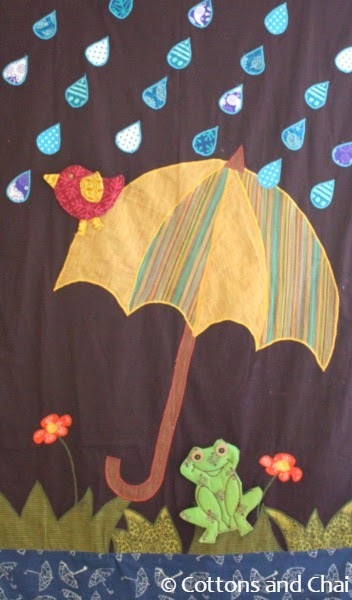 Our entry - A Rainy Day Quilt - was inspired by the Indian monsoon season: the deliciously wet green grass, fat raindrops, little wild flowers popping up after the parched summer days, the sound of croaking frogs and streets dotted with colorful umbrellas. The umbrella: This was going to be front center, the focal point inspired by the umbrella print fabric. 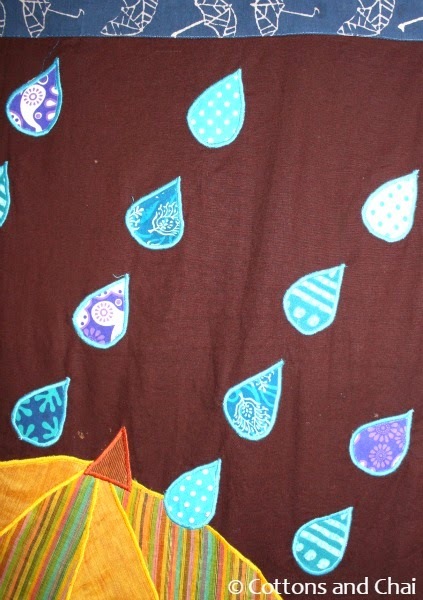 The raindrops: I decided to use up fabric scraps from 5 or 6 different shades/ prints of lovely blue fabric to create a pretty pitter-patter-raindrop collection. The bird and frog: Now, this was the funnest part of all. At the time that I made this quilt (late 2012), my son was a few months old and I knew it wasn't long before he would start to crawl around. That's how I decided to design this quilt as a play blanket where he could have a good time sticking and un-sticking two cute friends to the quilt. First I drew patterns of a frog and bird on a piece of paper and cut out those shapes out of fabric twice (for front and back). Then with a piece of batting sandwiched in between I sewed them together and added details like the wing and buttons for eyes. 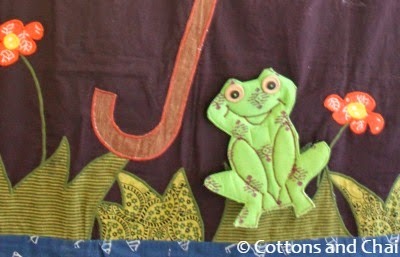 I added further detail to the frog by giving him a smile and outlining the shapes of his front legs using a zigzag stitch. 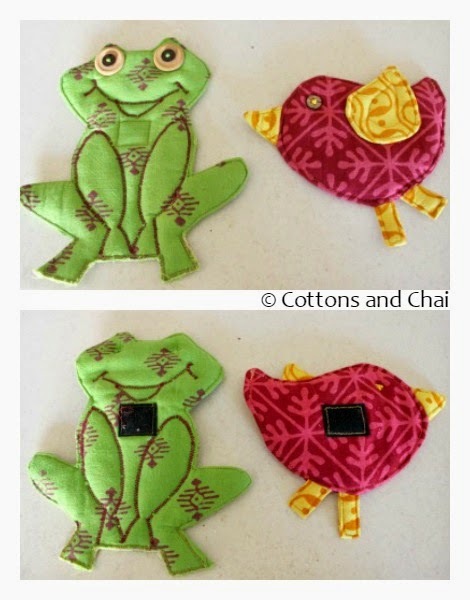 Lastly, I sewed on a piece of velcro to the back of the frog and bird. The opposite velcro pieces I sewed on the top of the umbrella and in the grass, so that the little birdie could be perched on the umbrella and the froggy could merrily croak among flowers! 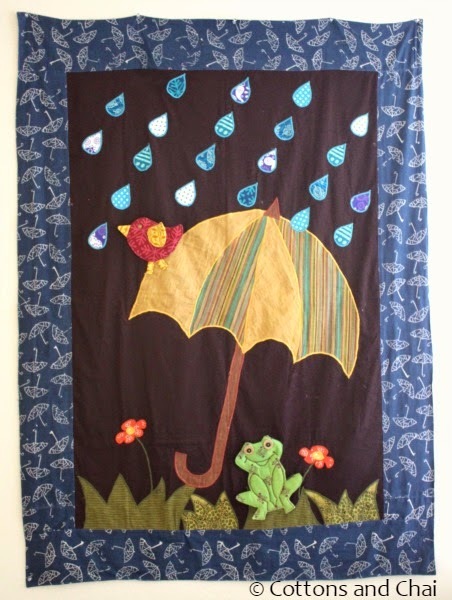 If this Rainy Day quilt has managed to delight you, please take a minute and give us a vote right here! Voting starts on November 1. Finished Size: 55" x 40"
Meanwhile, we're off to gawk at the stunning creations of other quilters at the quilt festival. Aww! That is too cute for words. :-) Loved every bit of it. I really hope you win. I clicked on the link to vote but was not able to see any quits to select/nominate. The voting starts 1st November but quilts will have to be nominated before that I guess. Thanks Priti, glad you liked it! LOVE this original design. Clever and cute! Thats one very happy looking frog. Thanks for visiting Shay and for leaving us a comment! wish you win! have a great day. Alejandra, thanks for visiting and your kind comment. I saw your quilt too, it's beautiful! How very clever to add the velcro for the frog and bird! I can just hear your son's happy giggles! Cute quilt! Thanks Sharon, yes.. happy giggles is right! That is so cute! I love the velcro frog and bird... genious! Thanks Sheri, glad you liked! I enjoyed visiting your blog too, the scrappy sampler and row robin quilts are utterly adorable! Totally gorgeous - your frog immediately brought a smile to my face, he looks so happy! Great work, good luck! Your quilt is adorable! 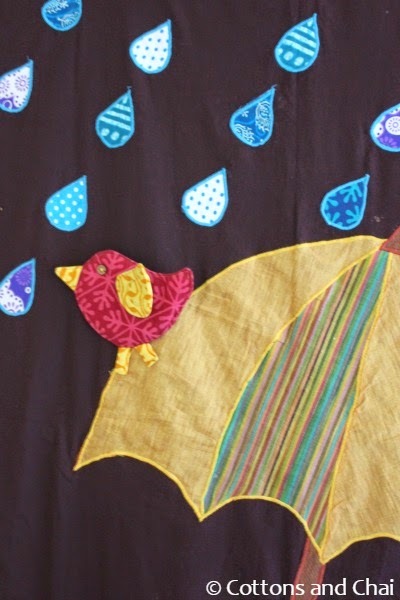 I love the way you did the raindrops out of so many different fabrics.